Cinco De Mayo is right around the corner and I stinking love Mexican food. I know that the holiday is not one about food, but aren’t all holidays like that? It’s always to celebrate something else, but yet everyone wants the dang food. 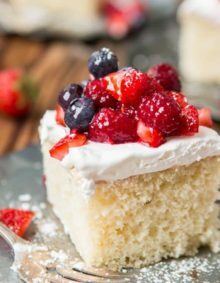 I was trying to think up something fun for the family since I’m pretty much the worst at holidays, but this Tres Leches Cake would be awesome. My friend, Maihsmy does it so well so I kind of want to beg her to make me one. And there’s churros but I’ve never really had one which just doesn’t make sense,but I’ll work on that. 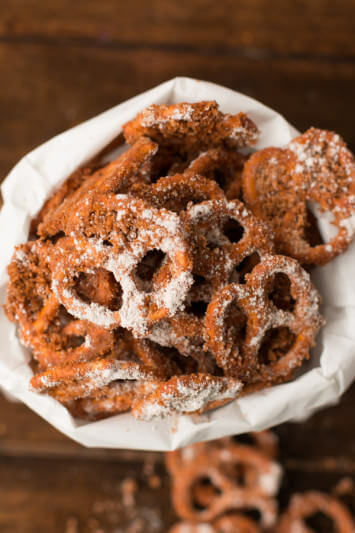 Yes, I love these little quick and easy churro bites, and these churro pretzels are pretty darn awesome too, but I wanted something fried, I mean different. 😉 Clearly dulce de leche churro donuts will work just fine. Ever since I discovered this whole frying a Pillsbury donut thing I’ve kinda become obsessed. I rarely do it because, well because it’s fried bread which doesn’t exactly make for a very healthy heart, but I am always looking for a new excuse to whip up a batch. So I’m going to try to resist making these fried 7 layer dip taquitos (yeah right, I’ll cave) and I’ll shoot for only dessert being fried. Plus this donut has a little surprise that takes it way over the top, Dulce de leche. Cade could swim in the stuff he loves it so much. 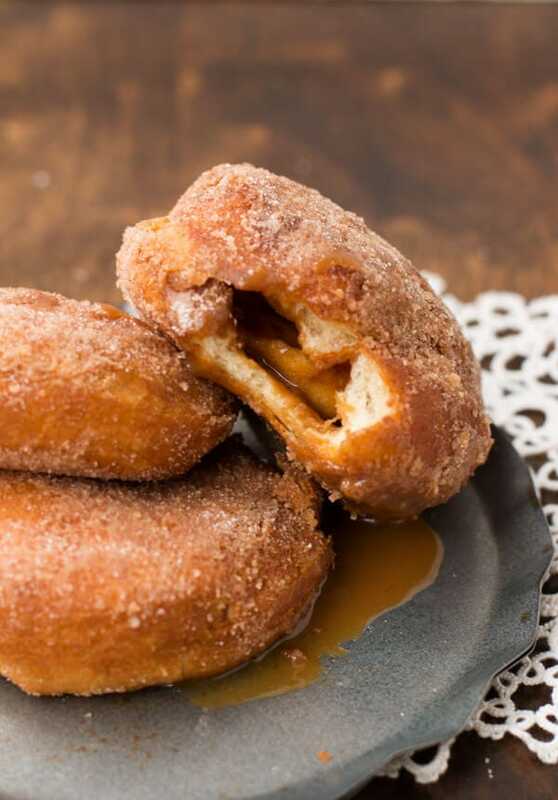 And let’s be honest I love everything about fried dough, stuffed with caramel and rolled in a cinnamon sugar with powdered sugar mixture. I think I just died a little saying that. It’s ok every once in a while right? Dulce de leche is sweetened condensed milk that is slowly heated until it reaches a flavor and appearance much like caramel. Where Can You Find Dulce de Leche? You can usually find dulce de leche in the baking aisle near the sweetened condensed milk. If you can’t find it there, check out the Mexican section of your grocery store or a specialty Mexican food store. What Is The Difference Between Dulce de Leche and Caramel? The difference is in the ingredients. Dulce de leche is a base of milk, sugar, and sometimes cinnamon. Dulce de leche is often made from sweetened condensed milk that is simmered for hours. Heat the oil to 350 degrees, or over medium heat in a large cast iron post. Fry 2-3 donuts at a time, turning over halfway through and drain on paper towels. Melt the dulce de leche on 30 second intervals in the microwave. 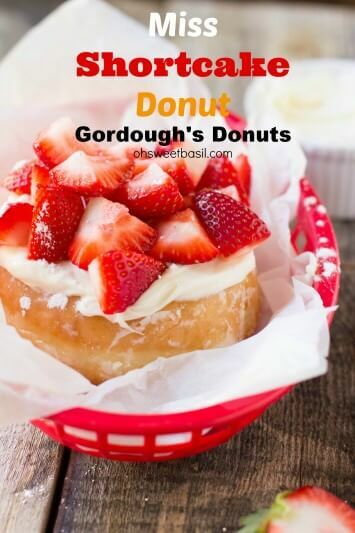 Pierce each donut with a knife and using a pastry bag or squeeze bottle, fill each donut. In a dish, combine the powdered sugar and cinnamon sugar and roll each donut in it. These may be the most delicious donuts I have ever had. We made them in a deep fryer, so no issues with temperature. The only issue is that they are TOO easy to make – and we will eat them all with no control. Do you have to serve them right away? Hi Andrew, since these are fried it really is best to serve right away. Ok thank you. will they still be as good if they are cold? I made these this morning. The first 3 looked and cooked great but the last 5, they burned on the outside and the middle was still uncooked so I had to toss them. I tried reducing the heat on my second batch but I think it was too late by then. I wish I had a fryer, I think that would have helped. The first 3 were a hit though Delish! Lexdis, your stove sounds like mine, everything is at a great temperature and then it gets hotter, cools off and gets hotter again. It makes frying so annoying so I have to pull the oil off the burner for a minute and then put it back on and keep going. These are so awesome!! Found your site through pinterest (duh). 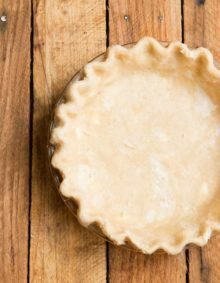 I used the southern style grands biscuits in our deep fryer and they turned out perfect! We halved the amount of cinnamon sugar and powdered sugar and still had a little left over after rolling each of the 8 in it. We didn’t have caramel sauce, so used Hershey’s chocolate caramel frosting to fill the inside. Yum! oh my goodness, I bet that filling was AWESOME!! And now I’m hungry. Haha, thanks for commenting! I tried making these, but they turned out doughy in the middle. I had the heat turned to medium and the biscuits turned nice and golden brown. The outside was cooked but not the middle. Do you have any suggestions on how to solve this? Should I fry them in low heat for a longer time period? Thanks! They look delicious! Darnit! I’m sorry. That’s the hard thing about stoves, they can all be ridiculous. I’d separate each biscuit and press them out a little more to make them thinner, then turn your heat down a stitch and let them cook on one side and then flip to help ensure that they cook through. aaaaaand I’m drooling! 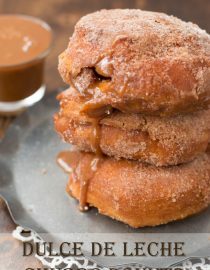 I love the crispy fried goodness of the churro doughnuts and that the sweet gooey dulce de leche! ahhhh SO GOOD! plus, fried food is always good. ALWAYS. Oh my gosh. I think I’ve died and gone to heaven. 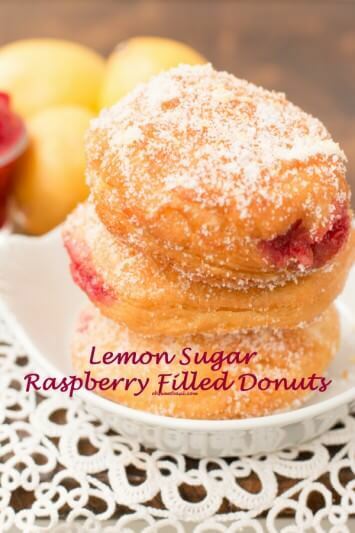 These donuts really do look amazing–love that puffiness! I believe you’ve just made the best of two worlds collide 🙂 now I’m craving me some Disneyland churros…thanks for sharing! Pinned! Delicious! Love anything that has a dulce de leche filling- amazing! Can’t wait to try the recipe! Me too! I’m such a sucker for that stuff! Oh my goodness these donuts look amazing!!! 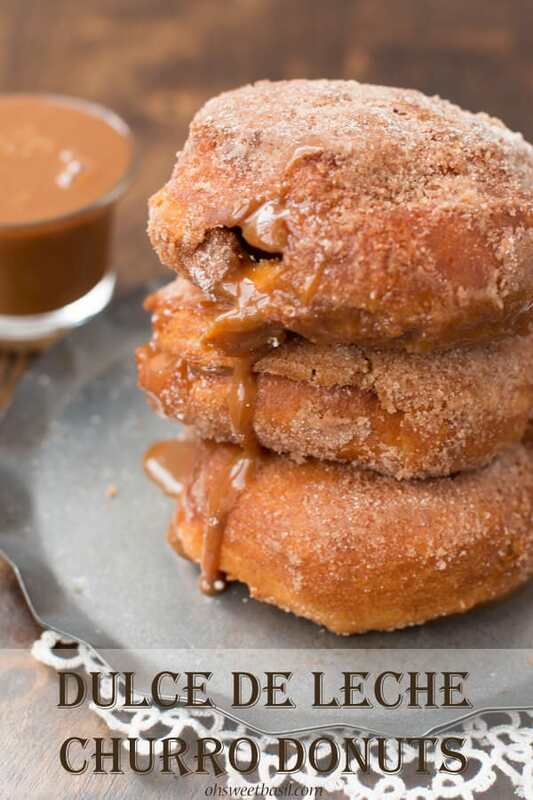 Like you just took the whole churro thing and then blew it out of the water by stuffing it with dulce de leche!!!! Want immediately! And your’s were to die for!! Pinning them! 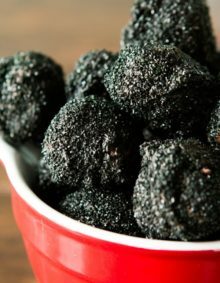 These seriously look amaze-balls! Churros are so good anyway, let alone as donuts! Woah! These look fantastic, Carrian! Sharing! I think I’ve died and gone to heaven — a very delicious heaven. Need these in my life RIGHT NOW. Me too! And it’s a heaven where calories don’t count so we can all chow down without feeling sick to our stomachs! Looooooove these. You keep coming up with more and more creative recipes every time I stop by! pffff! You’re the queen of awesomeness! Oh my, what a way to indulge! Looks incredible, Carrian! Goodness, these look incredible!! I love dolce.